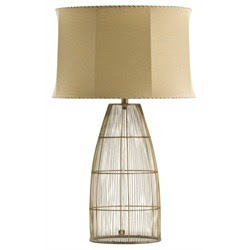 Corbin Antique Brass Wire Lamp - The antique brass wire base paired with the linen shade give this lamp an organic feel. This lamp is perfectly sized to fit on any side table or buffet and its clean design can work well with many different styles. 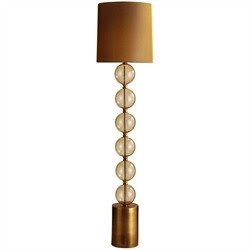 Miramar Glass / Brass Floor Lamp - The unique design and perfect scale of this floor lamp adds interest to any room. The hardware showing through the clear base gives it an industrial feel that is softened by the curve of the glass and the soft shimmer of the gold shade.